Ra.One is a new hindi film which has created enough roars and raves in the entire film industry because of the prospective transition phase it projects in film industry. Not many films are science fiction, with Ra.One, bollywood is gearing up towards producing science-fiction movies which could contain amplified effects, mind driving action and unreally real possibilities of futuristic living and powers. In this movie – Ra – One, Shahrukh khan ( G.One )is the leading actor in positive role while Arjun Rampal will be in negative role. Kareena kapoor plays the female lead role. This movie is claimed to be one of the most expensive hindi films ever made. The shooting of the film is done in USA, Mumbai, Goa and London. This movie involves heavy post-production work because of the type of the film it is and hence the cost of production has gone remarkably high. SRK has very high hopes and expectations from the movie. 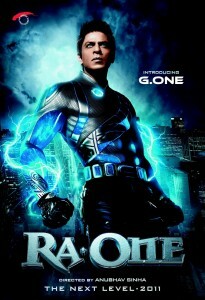 Likewise, people and movie-goers are also very eager to watch ra.one as soon as possible. No doubt, this movie will be the biggest hit of the year.